It was the shock of my life when I heard myself say to Ryan over the weekend, “I could see living in Briarwood.” That only makes sense if I explain to you that Briarwood was the other half of my extended neighborhood growing up. In Queens. Which I guess means that two years after my family coming back into my life after 20 years apart, all the ghosts are finally at rest now. In 2015 when my nephews found me again and the remnants of my family started to glue themselves back together, the old wind was blown out of the sails of Ryan’s and my combined desire to move west from Chicago, and new wind was blown in from what was for me the most unexpected of places. No longer did the road forward involve the permanent 70-and-sunniness of Los Angeles which we had already been looking forward to for two years. Instead, I blogged that our final destination would prove my 14-year Chicago excursion to be a round-trip: we would move in the other direction to live near my family in New York. Of course now it’s two years later and we’re still in Chicago. How did that happen? I really should have seen it coming. For most of the time I’ve lived here, until my Rachel Shteir moment, no matter how difficult life had been, I had always had the feeling that at the end of the day I could wrap Chicago around me like a warm blanket and go to bed grateful that my life was occurring here. In this powerfully quirky place that so deftly combines the overwhelming nature of a world city with the nurturing aspects of a small town, giving you the ability to explore and take chances without facing the higher, do-or-die stakes of more expensive, less supportive coastal cities like the one I’m from. That hard-to-replicate combination is what kept me here in 2007, the last time I almost moved home. It’s something that led Ryan and me into lots of difficult discussion before planning to move to Los Angeles a few years ago. I don’t know why I thought I had it worked through just because my family came back into my life. Especially since New York is a far more emotionally loaded place for me—as anyone’s hometown can’t help but be. That the financial building and rebuilding we’ve had to do since 2015 delayed things did not come as a surprise. We spent our Los Angeles nest egg for me to open Benami Media, so the New York move wouldn’t have happened immediately anyway. What did come as a surprise, though—especially for Ryan—was the amount of discussing and re-discussing, deciding and re-deciding, changing my mind and changing it yet again, about just what our destination city was going to be after all. I love my family, but did I really want to give up an hourlong journey to Disneyland and the best avocados ever? How about an hour commute to east-coast Disney, especially after discovering that while it might kill Ryan, I have a great affinity for Orlando’s six months of 1,000% humidity? Or we could just stay in Chicago couldn’t we? It’s not perfect and my family isn’t here but it’s affordable and how the hell are we going to afford my hometown? Do you really want to pay $5,000 as a legal bribe to a broker just to sign a lease? Da da da da da da da da da. Round and round went the carousel of cities in my head, over, and over, and over. You have no idea how many times Ryan threatened to leave if I opened up that discussion just one more time. Or how many times we actually did break up over it for an hour or an afternoon. And yet, every time my good sense came in for a landing in Queens, it took off once again, headed for a region with earhats and a warmer climate. I had to acknowledge what was good. What does that mean? First, I knew in order to go home, I had to love my hometown. Not just tolerate it. But really find my love for the totality of a maddening, magical, aggressively ambivalent, hyperexpensive, my-way-or-the-highway world capital. Making peace with how I remember it—and how it has changed in ways that it never asked my permission to change. And second, I knew I had to finally love my past, instead of constantly re-wounding myself in the present over the pain and insanity of so many years ago. I had to be OK not just with my family as it is now, but as we used to be—including finally acknowledging and embracing that like every family’s life together, it may not all have been good, but it wasn’t all bad either. I started working all that out on my visit home last April, when I decided to take a chance and visit the street I grew up on for the first time in two decades. The visit helped me put the worst of the ghosts to rest, but it longer for me to realize that I didn’t have to leave everything about the past in the past, as I had spent so much time trying to accomplish. During the eight years I lived in Brooklyn before walking away from New York completely in 2003, you couldn’t pay me to spend more time in Queens than absolutely necessary. Flights out. Flights back in. Occasional visits to friends in the borough of my birth. Then back to Brooklyn as quickly as humanly possible. I needn’t have rushed; it isn’t as if my siblings ever came to look for me. Still, as far as I was concerned, the door was closed on Queens and everything in it for good. Ever since that door reopened two years ago, I’ve struggled to understand what has kept me from wanting to walk right through it and go home as quickly as possible. Sometimes the answers we struggle hardest to find are standing right in front of us, so obvious that we keep looking through them and around them, instead of realizing they’ve been right here all along. Briarwood was my answer. In 22 years since leaving Queens, 14 years since leaving New York, ten years since turning my back on the chance to move back home in 2007, and two years since my family came back into my life for good, there’s one thing that I have never, ever done. I have never allowed myself to feel good about my past. Letting the ghosts be at peace means nothing, if after forgiving all the bad stuff you don’t allow yourself to uncover and, finally, honor the good stuff. Stop with the ghosts, and all that’s left to feel is numbness. Acknowledge the good, however, and something amazing happens: you unlock the joy. I didn’t unlock it on purpose. But life led me there just the same. In the middle of trying desperately to have all the feels for moving home and faking myself out with worrisome visions of $3,000 Gotham one-bedrooms, I had the idea to look at apartment listings for all the neighborhoods I knew as a kid growing up along Queens Boulevard. And if I was going to do that, I might as well include Briarwood. Briarwood turned out to be affordable—which shocked me, so I started to wonder what life might be like there for Ryan for me. Which shocked me even more, because I realized I was wondering about living in what is, essentially, my old neighborhood. And as all my old protests started to well up inside of me about my past in Queens, for the first time ever, I started to doubt them. It literally was like floodgates opening. Only instead of being bombarded with mental videos of family fights and grudges and drunken binges, suddenly I was tuning into a different station, remembering joyful moments that I haven’t let myself get anywhere near in years. The extended neighborhood of my childhood began at Queens Boulevard and Hillside Avenue and, as I got older, eventually extended all the way to the LIE. First on the Q60 bus, then on the subway, I was allowed to journey on my own up the boulevard one neighborhood after another. Kew Gardens. Forest Hills. Rego Park. Elmhurst. Along with Briarwood, today, all still surprisingly affordable neighborhoods by New York City standards, since most non-Queensites don’t want to deal with the half-hour schlep on the subway to get to Manhattan from their mid-borough reaches. But I didn’t need the subway to get to Briarwood. 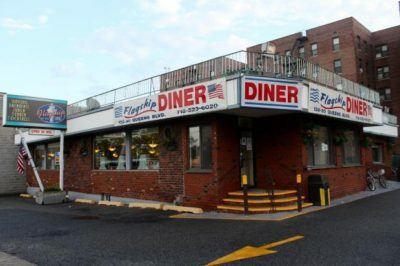 All I needed to do was get to the other side of the Van Wyck Expressway footbridge, connecting the church where I was baptized three religions ago with the backside of the (sadly soon to be no more) Flagship Diner, where my sister introduced me to a lifelong love of silver-dollar pancakes and always requesting a booth over a table. Thinking about Briarwood, I paused on memories of Patricia and me at the Flagship and smiled. It was the first positive thought I’ve allowed myself to have about my sister in my adult life. So of course it turns out that like every family, our life together was and is a mixed bag. And more than I cared for a very long time to admit, a lot of our past time together was loving and good. Maybe sometimes in spite of ourselves, but we had our moments. The love that I feel for them today isn’t something new or transcendent. It’s something abiding that over the past two years has only grown from what has been there, in hiding, all along. Now I won’t say time heals all wounds, because I don’t think it does. Only forgiveness lets that happen. But it’s hard to be angry at a brother and sister whose struggles with alcohol and drugs both ended the hard way. And none of it was the fault of my surviving nephews—or of my hometown, for that matter. And everyone else who is still troubled among us is just going to be who they are at this point. I can handle them with a lot more love, forgiveness, and healthy boundaries now than I could 20 years ago. All of that flashed through my head, and my heart, the moment I gave the potential for joy at the other side of the footbridge the benefit of the doubt. Like your life passing before your eyes, but in a good way, for once. Since the weekend, I’ve found myself daydreaming about my past in Queens and having ever feel possible about our future there, too. Finally. Until I could take the subway on my own without my 1970s mother smacking the crap out of me, Briarwood was as far as I could go on my own. Every Saturday with my allowance in tow, for a comic book at the stationary store by Main Street, and a Rocky Road cone at the Baskin-Robbins next to Liberty Bank. The ice cream place is long gone, but the stationary store is still there. How good is it to know some things never change?